In the second book of bestselling author Jerry S. Eicher's new Land of Promise series, Miriam Yoder is looking forward to her wedding day with Wayne Yutzy. But when beautiful Esther Swartz arrives to care for her ailing grandmother, Miriam is wary of Wayne's past relationship with Esther. When storms rip through the small Amish community in Oklahoma, Miriam's daett arrives to help in the rebuilding efforts. Under pressure from Miriam's daett the relationship with Wayne is upended, leaving Miriam to wonder if she must now build her new life as a single Amish woman. This book kept my interest from beginning to end. I really though can't imagine all the things that happened in Miriam's love life happening to me. Yet the circumstances are not so far fetched and I believe that they could happen to anyone. A Blessing for Miriam, flows easy with the wonderful descriptions of the countryside, the houses, and the buggy rides. You feel as though you are in the midst. My favorite character was Miriam who is so loving and hard working. 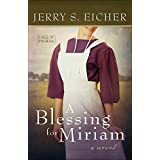 The author Jerry S. Eicher leaves the book with an ending for Miriam that wasn't what I expected at all. I'm willing to accept the ending but not sure I really like it. Although this is the 2nd in the series it can stand alone. I was given a copy of this book from Netgalley in exchange for my honest review.